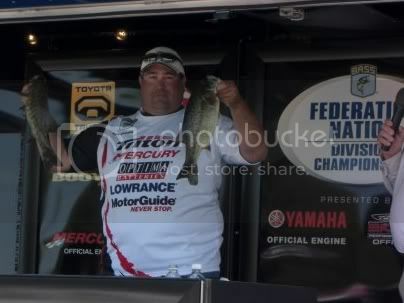 Rick Powers shows his 7.47lb Largemouth Bass. 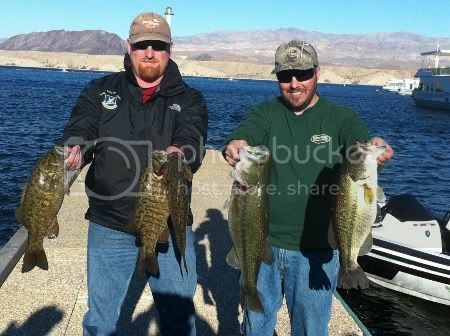 Rick and his son Richard weighed in 15.93lbs of Lake Mead Bass. Bass Anglers Federation met at Temple Bar Marina Saturday March 8th to hold the third tournament of the 2013 season. After a week out solid weather with water temps on the rise angles anticipated some spawning activity. That expectation was shoot down when a cold front moved though the Lake Mead area lowering temperatures and rain all day Friday. Saturday mourning anglers launched to low 40 degree temperatures and cloudy skies and light wind. Third place was the team of Kieth Van Riel and new member Zach Holt weighing in 4 bass at 9.63lbs. Second place team of Paul Hemsley and Deejay Evans show 4 of the 5 bass limit of 12.07lbs. Winning team of Rick and Richard Powers show their 2 best bass. Paul Hemsley and Matt Durham showing most of their 15.90lb bag. Gary Freeman and Ellison Hubbert weighed in 11.01 to take second place. It was a crisp Saturday morning and the weather cooperated with temperatures in the 30's at the start of the day. Ten boats showed for the start of the 2013 season. Calville Bay was selected for the first tourney and with the water temps in the high 50's, it was thought to be a day of grinding out five fish. At the start, boats went in every direction and, without wind, the whole lake was available. At the weigh in, we were short one boat and learned Dave Hudson and Rusty Ruby had engine failure. Limping back to Calville from Temple Bar, Dave and Rusty failed to make it in time to weigh in two fish. We got word that they made it through the narrows at the conclusion of weigh in, and showing exceptional leadership skills, our newly appointed president, Doug Jones, raced out to tow them in as the sun quickly set. Landing in third place with 9.57 lbs. was Toby and Meek with a nice 4.7 lb. largemouth. 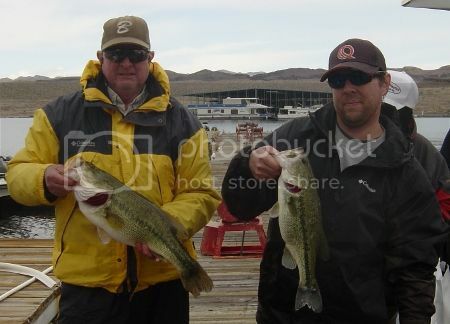 Gary and Ellison came in second with 11.01 lbs. And, winning the second tourney in a row with a big fish of 5.15 lbs. and 12.92 lbs. total was Keith and Larry. Congratulations to Keith and Larry. Keith, a.k.a. KVR, said that his boat sat for 10 months before he came out to fish our December tournament. Winning two tournaments in a row with solid kicker fish after that long of a layoff is paramount. So expect to see him fish like he's got a target on his back this year. A special thanks to Paul and Zach Holt for being the launch boat and weigh masters. Expect to see a lot of new faces this year and let's all do our part to help those new to our club experience a great day on the water. Welcome to 2013 with the Bass Anglers Federation. Gary Freeman and John Hans showing off there winning bass. 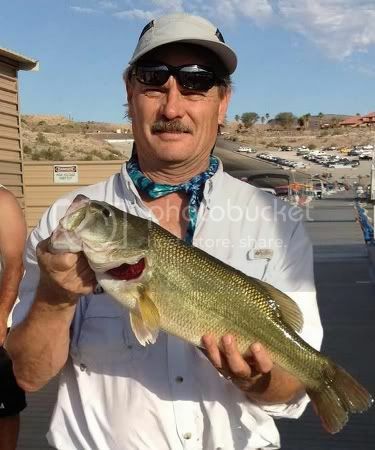 Bass Anglers Federation held our July Tournament from Callville Bay. Ten boats launched at 7pm and met back at 7am to weigh in. Competitors set out to 115 degree temperatures and light wind. The weather held out all night with light wind and calm conditions lasting till weigh in. 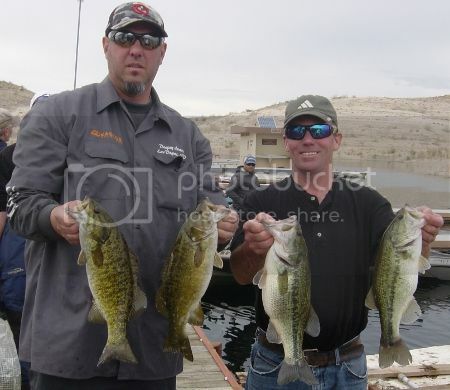 Taking third place was points leader Doug Jones and Randall Bruce bringing in a weight of 11.28lbs. 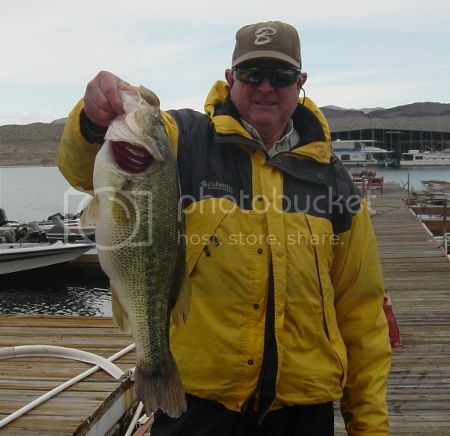 Randall brought in a 5.83lbs winning big fish. Second place team was Rob Jeanotte and Larry Holona coming in with 11.38lbs after a .2 lb dead fish penalty. Rob is new to the club and showed he can catch fish. in the backs of coves and spent most of the night in the Las Vegas Wash.
Congratulations to Gary Freeman and John Hans for taking the win at the July Night tournament. 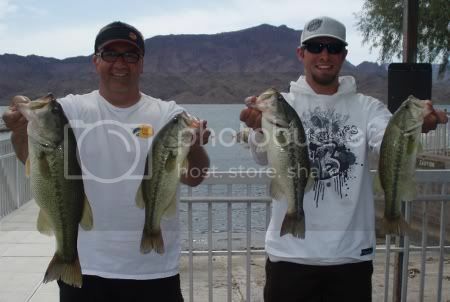 Anglers look forward to May 5, 2012, the second of four Qualifying tournaments of the 2013 Nevada State Team. 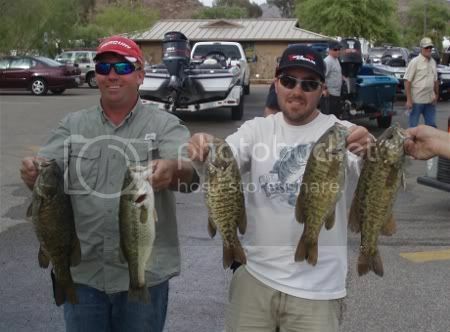 Congratulations to Brent Becker and John Hans for taking the win at Lake Havasu with a two day total of 31.16lbs. Brent Becker and John Hans showing off there day two fish with a 6.21lb kicker caught by Brent Becker. 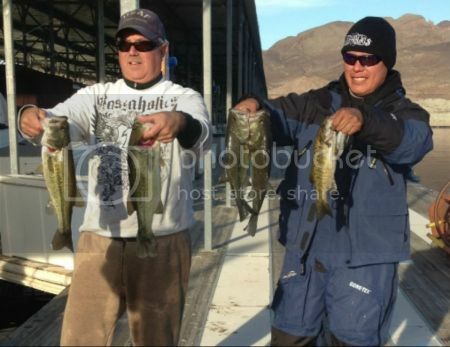 Bass Anglers Federation held the March tournament at Lake Havasu. 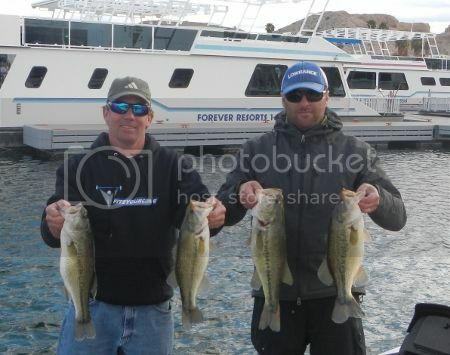 Ten teams made the trip to Lake Havasu for two days off spring time fishing. The angles were treated with great weather with the wind coming up on Sunday afternoon. 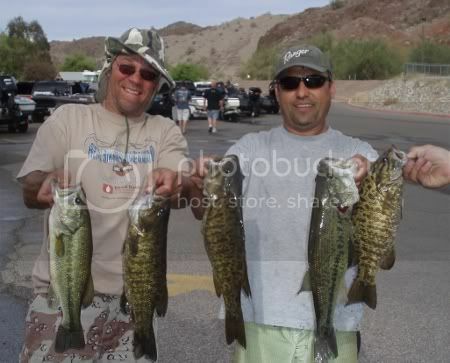 Lake Havasu fished well with plenty of fish in full spawn mode. Day one started good with most teams coming down Friday to mark fish for Saturday. Ten teams Launched at 6:20am as they set off to there biggest fish. Most teams found fishing good finding small mouth bass on beds all over the lake. At the end of the First day Alan Zamora and Murphy held the lead with 17.29lbs. Sitting in Second place after day one was the team of Paul Hemsley and James Cope bringing in 16.1 lbs. Sunday started out with calm wind and light cloud cover. The ten teams headed out on the lake for another great day of fishing. At the end of the day it was Brent Becker and John Hans with 16.56lbs on day two taking the win. Brent and Jon caught a two day Total of 31.16lbs. Ending up in Second place was the team of Tim Myers and Cody Robison bringing in a solid 14.48lbs on day two for a total of 30.03lbs. 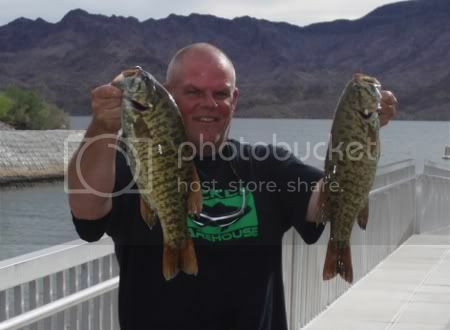 Don Hill showing some Havasu Smallies. 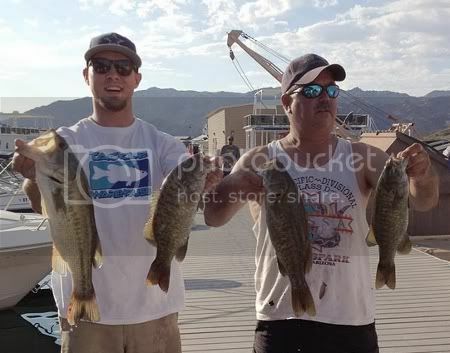 Doug Jones and James Cope knock everyone's lights out on Lake Mohave with a HUGE 22.19lbs sack. Doug Jones and James Cope show off there Monster Bag. "I Love Lake Mohave In February." said Brent Becker as we concluded the weigh-in of the February tournament. A lot of big fish made the scales at the end of the days fishing. Anglers started the day with 20-25mph wind at launch and light cloud cover. As the day went on the wind slowed slightly in the late morning and pick up again after noon making Lake Mohave rough to say the least. Second place team was Dave Naugle and Marco Irneze. 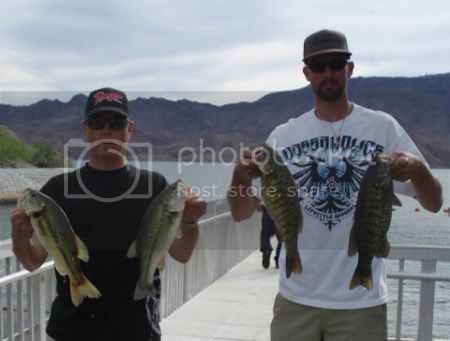 Dave and Marco brought 5 Largemouth Bass to the scales that went 15.61lbs with a 5.16lb kicker. Taking the win by a large margin was Doug Jones and James Cope. The team brought in 22.19lbs of bass, 3 Smallmouth and 2 Largemouth Bass, wth the winning big fish of 7.75lbs. 'We fished steep bluff walls around Cottonwood Cove with hot pink jigs and bubble gum worms texas rigged in 40' to 50' deep." said Doug Jones. " Most of our bites came while the bait was falling" said James Cope after weigh-in. 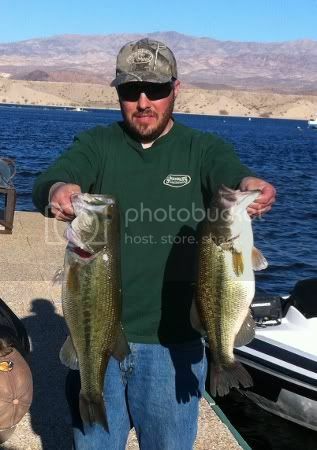 Big fish Winner James Cope with Two Monster Lake Mohave Bass. Congratulations to Doug Jones and James Cope for Dominating the February tournament.